The pure joy of running into the surf! The feel of the waves as they crash into you. Laughter bubbling as you run out of the sea and back in again. The feel the sun warming your sea cooled skin. We should all live as a child does. To live with such attention to the moment. To enjoy each moment to the fullest. Instead, more often than not, we’re planning the future. There’s a constant internal monologue about what needs to be done. A constant planning for what is happening next. But this means we are missing the moment. We are missing the present. We are missing out on our lives. We’re missing the moment at hand when your child is laughing in the waves. We need to be able to live in the moment, to enjoy life completely and without reservation. This particular afternoon, I was in the moment. I remember the laughter. 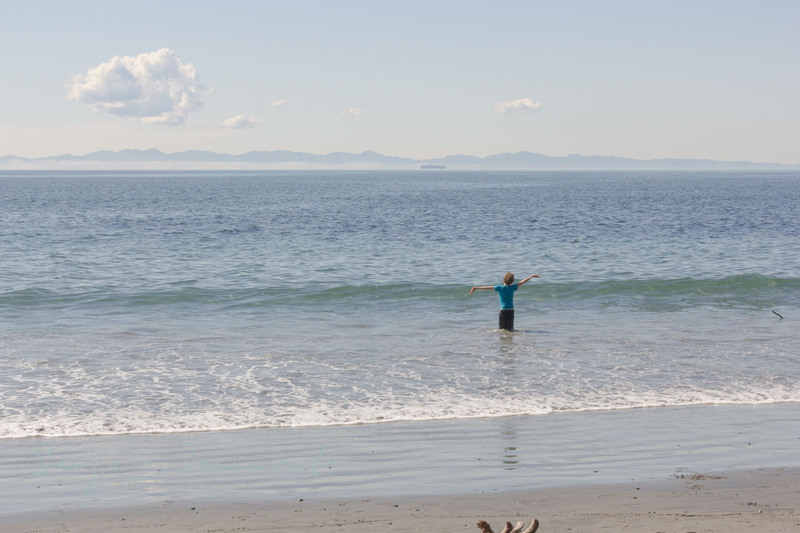 I am capturing my son’s joy as he’s playing in the ocean, making the photographer in me ecstatic. I’m playing in the surf, running along the beach and laughing with my son – I am breathless. I hear the cascading sound of the waves as they crashed to the shore. I fell the softness of the wool in my fingers as I took some time to cast on my current project. How? How did I stop the constant internal monologue? It was actually quite simple. Not easy but simple. Two things. I had a plan – a boring adult plan. It wasn’t a complex plan. We had to leave at 3:30. We were having pasta with ragù for dinner. There’s spare clothes in the car. Laundry is a Monday routine. Camp registration is on the To Do list in my Bullet Journal for this week (on paper means I no longer have to remember or worry about it – thank you David Allen). We have simplified our stuff and as a result our life. Not our schedule, as always we’re busy. This particular visit to the beach was at the end of a busy weekend that including karate, Cub Camp for my son and a quick couple getaway. However, by simplifying our stuff, I knew that, even after being away for the weekend with the various gear and clothes, it would be quick and routine to get things put right before the new week. Easy as it sounds it takes an effort to change habits, internal monologues and routines years in the making. Is it worth it? You betcha! Are you going to look back and remember the laundry that needed to be done or are you going to remember the joyful laughter of the day? Which would you like to remember? I know which I’d like to remember. So let’s live in the present and live with intention. Let’s LIVE an inspired life. Let’s live intentionally because once the moment has passed, it’s gone forever.